Written in the style of a business ‘tell-all’, Adventures in Franchise Ownership lays out what successful franchisees do that you won’t find in most owner’s manuals and includes franchisee Christy Wilson Delk’s good, bad, and really ugly days before her successful exit. Franchisees, like most small business owners, experience times of extreme frustration, lapses in motivation, and often exit before reaching their potential and their goals. 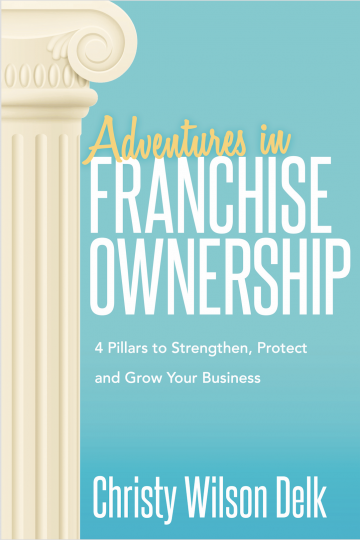 Based on Christy’s real-life franchise ownership adventures, this guide explains how the 4 Pillar Approach helps all franchise owners, regardless of market segment, get to the top tier of their franchise system. With humor, candor, and relatability, Christy fills in the gaps of the franchise Owner’s Manual by providing a constructive framework for finding professional satisfaction and attaining the financial success franchise owners everywhere want and deserve.